I'll never understand why buying clothes for small dogs gets so expensive! 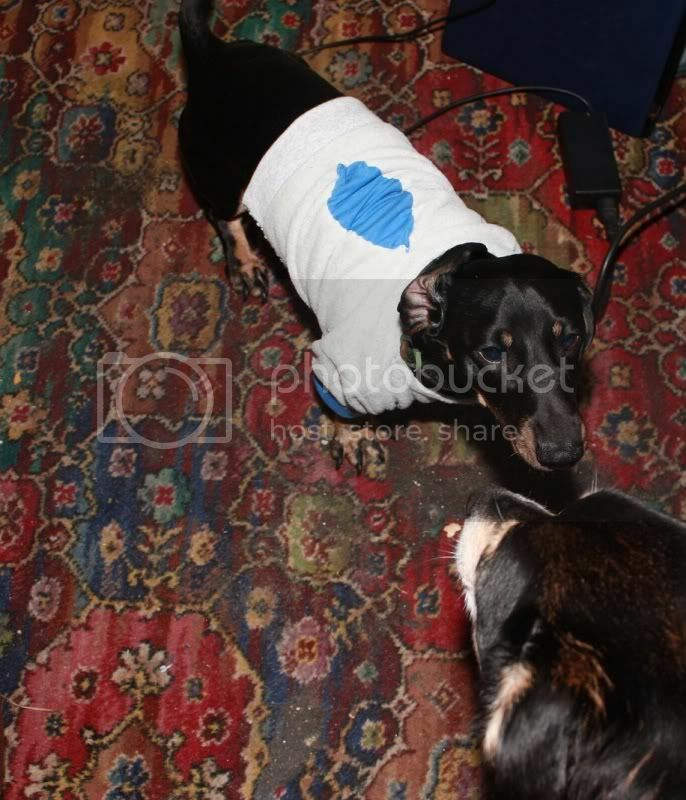 Our poor little short haird doxie gets so cold in the winter but I can't afford to buy clothes especially for doxies. So what to do...? 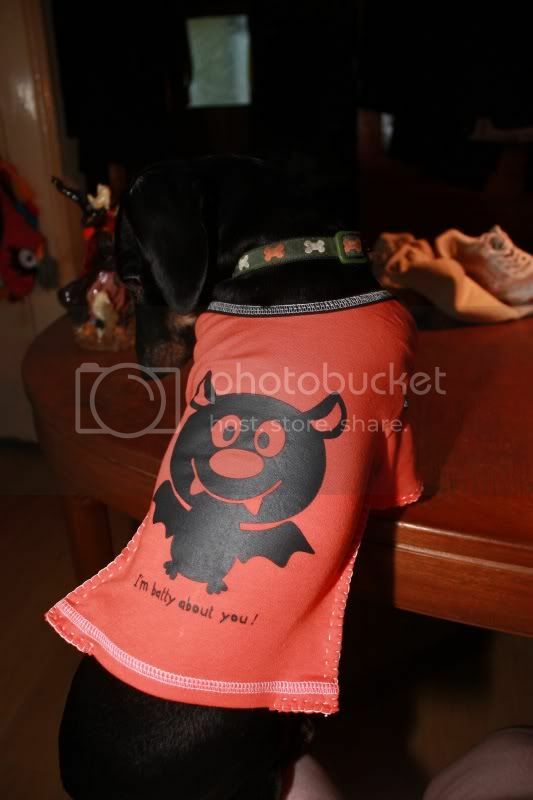 How about turn some baby clothes into doxie clothes?! I discovered that Dylan wears a size 6-9 months... With a few modifications. The first recon I tried was a fleecy hoodie. 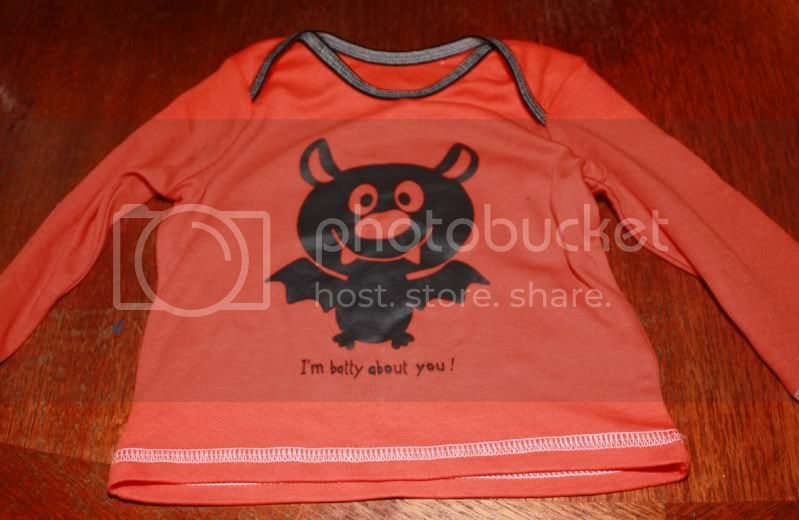 If I'm haunting the baby section at our local department store for my dog, is it time to think about having kids? Lol. Anyone interested in another round of this? I figure now would be a great time for some photos! Possibly with a late November/early December send out? Just a thought. Any thoughts on another dishcloth swap? Is it round 9? I made the base for this one in the autumn and never got around to finishing it until now. My dh calls it "my artistic interpretation of a tree in autumn." Meaning it doesn't look anything like a tree but he doesn't want to hurt my feelings. 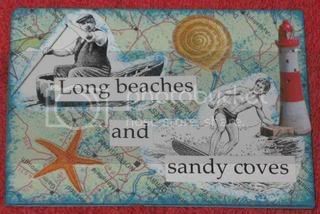 This one was made out of different pages from a book about the British coastal villages. I made it because I was freezing and hoping summer would hurry up and arrive already. I'm happy to be back into again and think my ATC supplies might just stay out for a few more days. 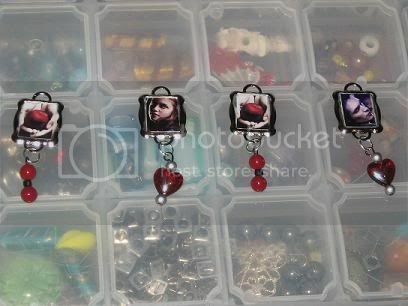 I'm going to a Twilight convention next weekend so I plan to spend the next week compulsively crafting for it. 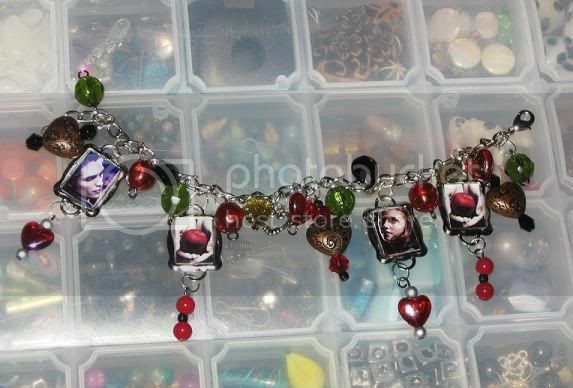 Starting with this bracelet. 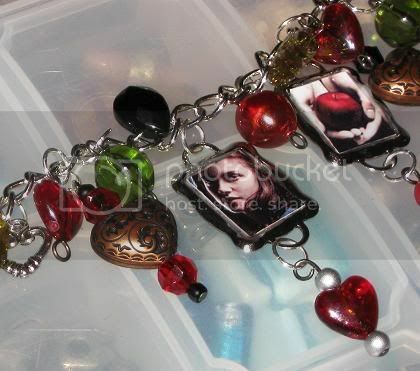 It's based on a charm bracelet I've had in my wists. 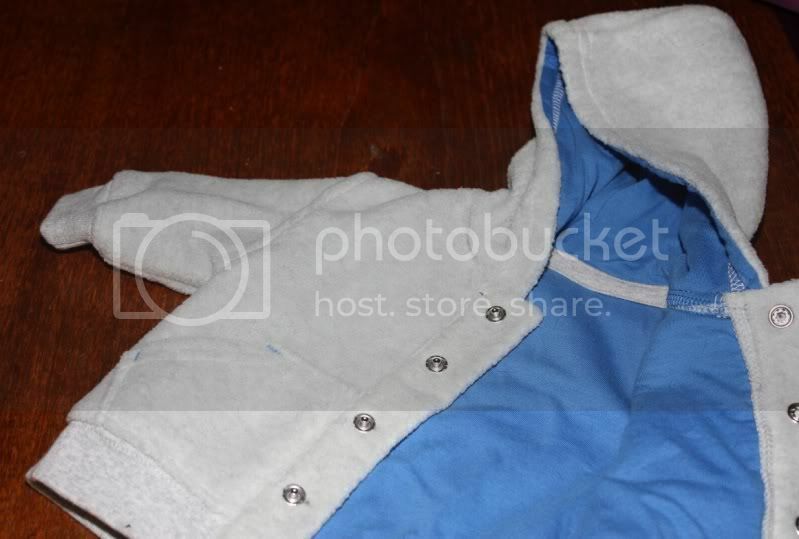 (The original is WAY more gorgeous but also completely out of my price range.) It wasn't planned so I just tried to do my best with what I had laying around. What do you think? 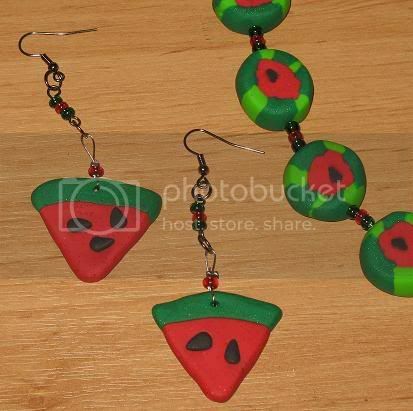 Disclaimer: I'm CRAP with polymer clay. But I enjoy playing with it anyway. I was looking at all the nifty projects made from polymer canes and finally decided I had to try it. 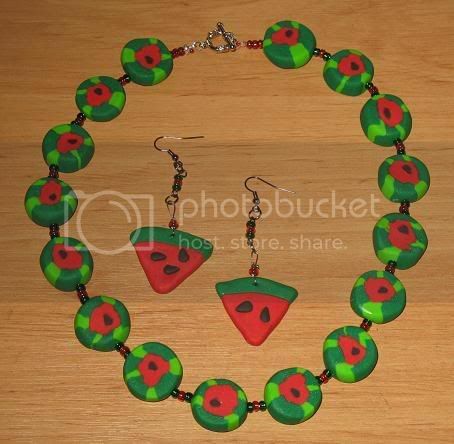 So I dragged out the box of fimo and started rolling. This was about the time my hubby gave me a sidelong glance and asked, "Are you sure you know what you're doing?" Well. I couldn't lie to the man. So I told him the truth: Nope. 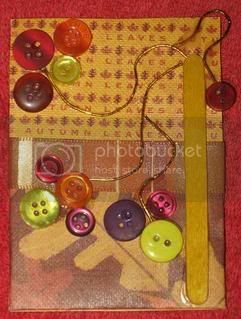 After a couple of minutes of silence-and rolling-he sort of shifted in his seat and said, "Well, um, don't you think that's an awful lot of fimo to waste if it goes wrong?" That's when I pulled out my how-dare-you-question-my-crafting-abilities stare. The necklace fits perfectly on my collarbone which makes me happy. 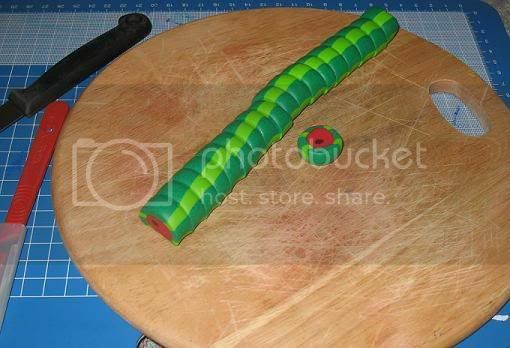 And here's the roll, cut into pieces. Should've taken one as I was working but I never expected it to work. You probably can't see it but the red and the darker green have glitter in them. Comments and suggestions would be very helpful! I always get a bit twitchy this time of the year, wishing Fall would just hurry up already!! Anyone else the same? Wanna make a swap of it? Okay...So this is my first post on this board so I'm pretty nervous. Also, I'm pretty useless in the kitchen so I'm extremely proud of anything I make that doesn't collapse or smoke. 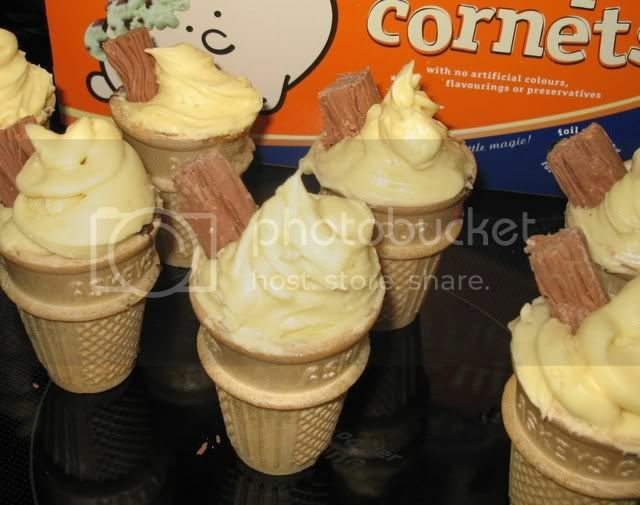 I saw my_butterfly's post https://www.craftster.org/forum/index.php?topic=246548.0 about ice cream cone cupcakes and I've been dying to try this out since. 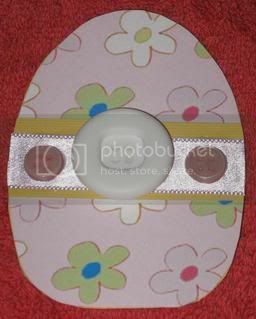 I use to love having these in elementary school! But, of course, I'm in Britain now so I had to give it a little update! 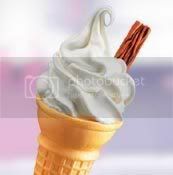 The 99 (as in that's how much it costs: 99 pence) if you don't know, is a vanillla soft serve ice cream cone with a Cadbury's Flake bar stuck in it. 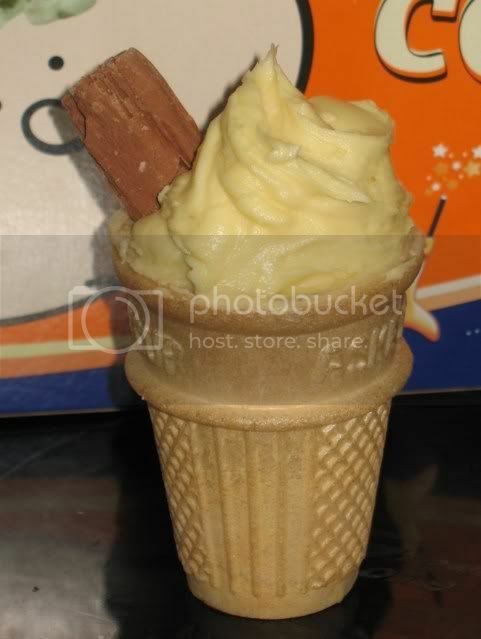 The ice cream cones are filled with a vanilla sponge and topped with vanilla icing with 1/3 of a flake stuck in the side. My MIL declared them absolutely adorable and my husband said he never wanted to know how many calories were in them. What do you think? As I've said many times, my hubby is AMAZING. Leave him home alone with my polymer clay too long and what happens? 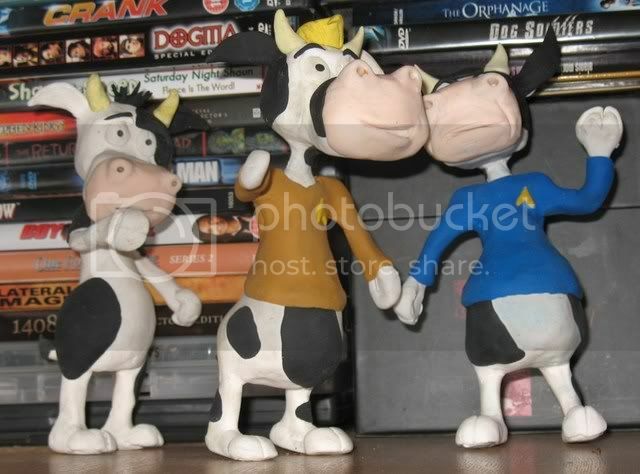 STAR TREK COWS. 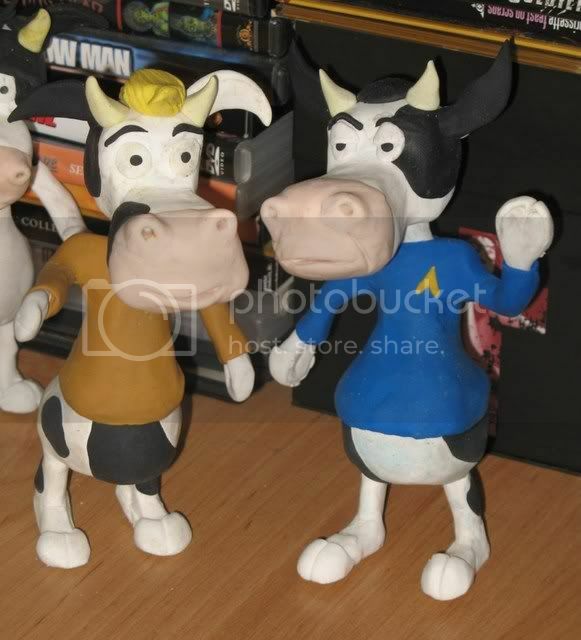 Captain Cud and Mr. Moock. (His names, not mine!) They're about 7inches tall. And don't look now but there's a devious looking cow sneaking up behind them! And he's naked! Yikes! What do you think? I'm totally jealous of his talent!